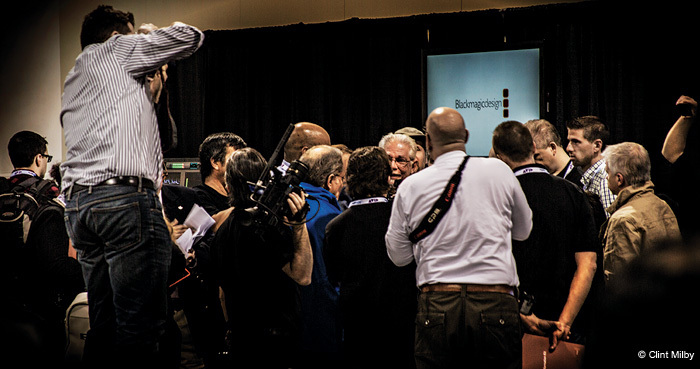 When I talked about Blackmagic Design’s first new camera, the Blackmagic Production Camera 4K, I also mentioned the real “show shocker” of NAB: the Blackmagic Pocket Cinema Camera. While the Blackmagic Production Camera 4K was a surprise, the Blackmagic Pocket Cinema Camera was totally unexpected. We’re still reeling from the implications of this tiny titan, and how it may shape the future of our industry. Let’s start by pointing this out: this is truly a pocket sized camera. It’s around the size of an iPhone 5. That in itself may not be too interesting however. There are a number of cameras that fit in your pocket. Where it gets interesting is the power this little guy has. It is truly a cinema quality camera. For the price of $995, the BPCC shoots Hi-Res 1080HD on a Super 16mm sensor onto a built in SD card, and has 13 stops of dynamic range. Similar to the BPC4K, it has all of the standard ports and connections, shoots in ProRes 422 and CinemaDNG 12 bit RAW, and can shoot in 23.98, 24, 25, 29.97, and 30 frames per second, and will be available in July. Which brings us to the potential of the Pocket Cinema Camera. It’s small size lets you build it up as large as you need it to be, whether it’s support gear, tripods, follow focuses, monitors, microphones, lenses, etc. Speaking of lenses, the Pocket has a Micro Four Thirds lens mount compatible with the variety of Micro Four Thirds lenses available However you can also equip it with a lens adapter to allow for nearly any lens you need. As you can see, with the proper set up you can transform the tiny titan into a massive machine of video production. You can probably tell that the Blackmagic Pocket Cinema Camera has me pretty excited. My fascination with the HDSLR revolution came from its democratization of the film industry, through quality of capture as well as financial accessibility. Even if this pint sized powerhouse doesn’t kick off a new revolution on its own, I’m sure it’s a sign of things to come. 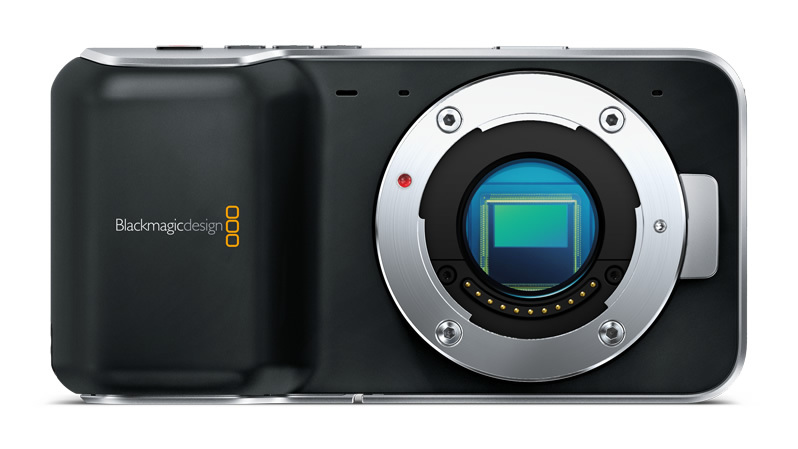 The Blackmagic Pocket Cinema Camera will retail for the price of $995 USD, and will be available for purchase this coming July. New compact Super 16 digital cinema camera with 13 stops of dynamic range, allows shooting with a professional film look in a beautiful design that fits in your pocket! Compatible with extremely high quality Micro Four Thirds lenses. Compatible with other mounts viacommon third party adapters such as PL mount and Super 16 cine lenses. Open file formats compatible with popular NLE software such as ProRes 422 (HQ) and losslesscompressed CinemaDNG 12 bit RAW. No custom file formats. Features all standard connections, including mini jack mic/line audio in, micro HDMI output formonitoring with camera status graphic overlay, headphone mini jack, LANC remote control andstandard DC 12 power connection. Supports 1080HD resolution capture in 23.98, 24, 25, 29.97 and 30 fps. • Compatible with DaVinci Resolve Lite color grading software. Blackmagic Design creates the world’s highest quality video editing products, digital film cameras, color correctors, video converters, video monitoring, routers, live production switchers, disk recorders, waveform monitors and film restoration software for the feature film, post production and television broadcast industries. Blackmagic Design’s DeckLink capture cards launched a revolution in quality and affordability, while the company’s EmmyTM award winning DaVinci color correction products have dominated the television and film industry since 1984. Blackmagic Design continues ground breaking innovations including stereoscopic 3D and 4K workflows. Founded by world leading post production editors and engineers, Blackmagic Design has offices in the USA, United Kingdom, Japan, Singapore, and Australia. For more information, please checkwww.blackmagicdesign.com.